Maybe she will claim a video caused her to commit a felony? (U) Use of information. The IC element will explain how it will use the raw SIGINT, to include identifying the particular authorized foreign intelligence or counterintelligence missions or functions that are the basis for its request. C. (U) Evaluation of requests. A high-level NSA official designated by the DIRNSA will review requests for raw SIGINT covered by these Procedures. NSA will document its approval decisions in writing and include a statement explaining how the request fully complies with paragraph A.
OK, a key person who should have participated in the legal distribution of intercepts involving members of Team Trump would be the Director of NSA and whomever they designated to review the requests. Note that the Director of the National Security Agency (NSA) is accepting the requests made by the National Security Advisor (a different NSA). Today that would be one Micheal Rogers, who had to review and concur on Rice’s request. Interesting enough, one would have thought the FBI would be the organization with due cause to unmask Americans for investigation. Why would the head of NSA be investigating Americans and violating their 4th Amendment rights? Well, that seems pretty obvious given that all this ill-gotten information landed in the hands of the left wing news media, to fuel diversionary stories about some elusive Trump-Russian connection. The fact this information takes a left turn through the office of NSA on its way to the news media is telling in itself. In February Cohen-Watnick discovered Rice’s multiple requests to unmask U.S. persons in intelligence reports that related to Trump transition activities. He brought this to the attention of the White House General Counsel’s office, who reviewed more of Rice’s requests and instructed him to end his own research into the unmasking policy. The strange thing is, if not for all the leaks to the newspapers, I doubt this review of the logs would have happened! She and Team Obama triggered their own demise. Of course, all this was leaked to a Dem-Friendly news outlet, which tried to spin this as a nothing-burger and claim this is not the smoking gun. But of course it’s the smoking gun! Let’s pick up where the left wing news media tried to stop us from proceeding. Who tipped off Rice on which raw data to unmask? And who was unmasked? The answers will inform us on her intentions. For example, if Rice’s request was broad and yielded a range of Americans unmasked that would be a general request without a target. But if her request was against specific events with specific foreign players, which only yielded results that led to only Team Trump, then that is a different matter. That would be political targeting and a felony. 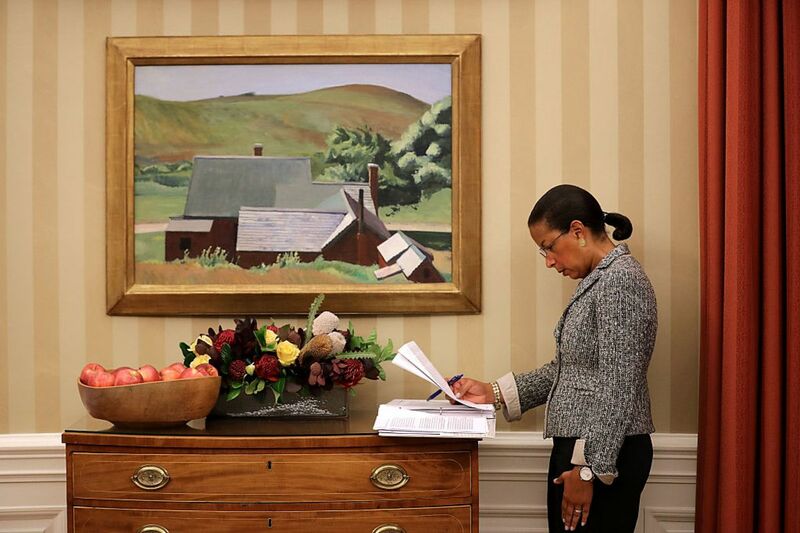 Finally, Susan Rice would never, ever do this on her own initiative. She would never risk “The Obama Legacy” over this. A legacy, I must say, that is now in tatters based on this news. It is just a question of whether the destruction of his legacy was due to ineptitude or criminal intent. There is much more to learn here. Everyone who did this knew they were crossing some serious lines. They knew this because they had to put in place the processes to allow it. And since these unmasking processes were laid out in January of this year, everyone knew they were up to, if not over, those Constitutional lines. Rice should be pulled in front of Congress and asked point blank under what authority was she, the National Security Advisor, requesting names of US Citizens and their communication contenrs? Recall, some of these requests are not related to Russia at all! People act shocked…Democrats use dirty politics as a matter of course. Goldwater was convinced Johnson had bugged his HQ in 1964. The Dems were caught eavesdropping on Newt Gingrich’s cell phone in 1995. And I’d bet good odds Obama was using NSA against Romney in 2012. Roll them up, crush them flat. This is a gut check for Trump…has he got the nerve to deal with domestic enemies of the United States?